I normally wouldn't write about shares or anything to do with finance (since this is a technology oriented Blog) but this time I'm making an exception. 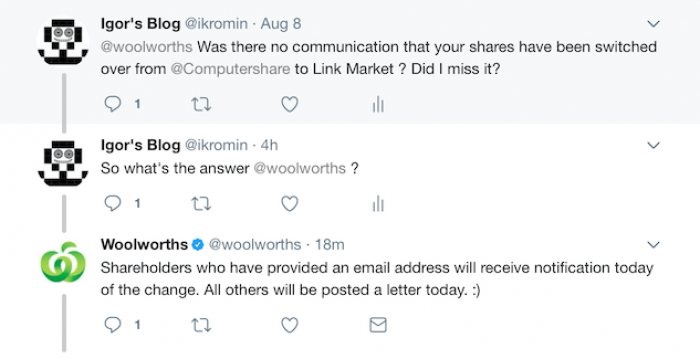 Failing to notify shareholders, Woolworths moved the management of your holdings out of Computer Share and into Link Market Services. Update (28 August 2017) - I finally received a notice in the mail informing me of this change. That is 24 days after it happened! Now when you log into your portfolio in Computer Share, you're presented with a warning message stating - "You have no accounts in your portfolio. If you have another account / holding, please go through the registration process to register that account." You're then given an only option to log out. This gave me quite a scare over the weekend! I called up Computer Share and they informed me that all the holdings have been moved on Friday the 4th of August! I tried to follow up with Woolworths on Twitter. They didn't reply for a whole day so I gave them a nudge and finally got this response - "Shareholders who have provided an email address will receive notification today of the change. All others will be posted a letter today. :)"
So that's almost a week after the change was made! You would think for something like this, a prior notice would have been given. 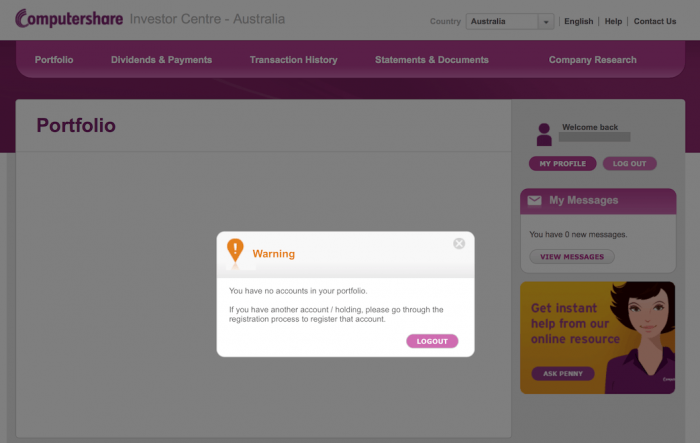 So to access your holdings you will need an SRN to prove your ownership. Then, you can register for a new account over at Link Market Services. All the past transactions, any reinvestment plans, dividend advise, etc is there.